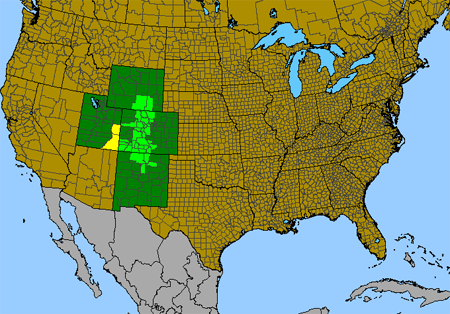 Subalpine, alpine. Openings, tundra. Summer. Placer Gulch, July 21, 2012. 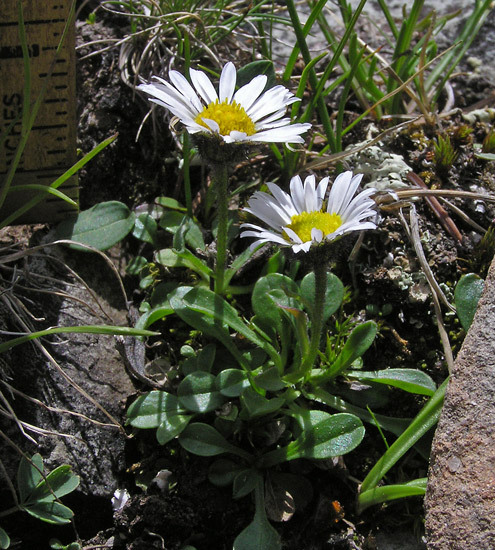 The top photograph shows a typical view of Erigeron melanocephalus from eye-level; the bottom photograph shows a particularly lush growth in a moist area a week or so after snow melt at 12,500 feet. 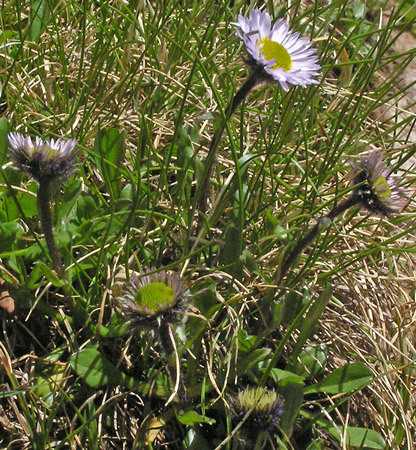 Black hairs on the green phyllaries (see the photographs below), basal spoon-shaped leaves, and a large, showy, almost always brilliant white series of ray flowers identify this very small and common high altitude Erigeron. Several short, often twisting leaves are common high on the flower stalk. Plants can be six inches tall but they are commonly as tall as the plant in the photograph at left, just two inches. 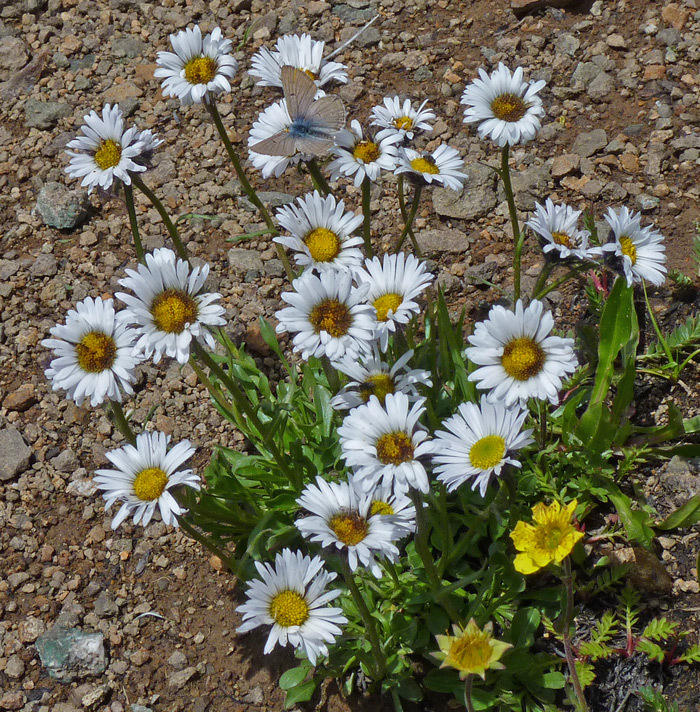 Many dozens of plants often dot subalpine and alpine meadows with their brilliant white flowers. 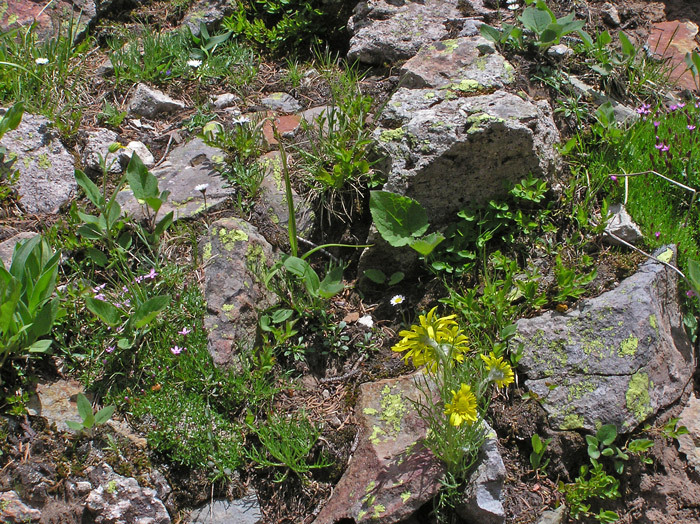 Aven Nelson first collected this plant in the Medicine Bow Mountains of Wyoming; he named and described the plant in 1896. "Melanocephalus" is Greek for "black head". 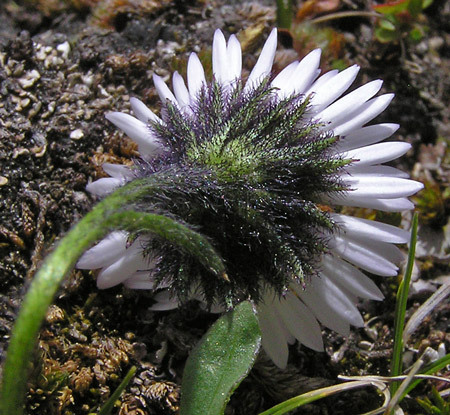 Floras often indicate that the hairs have dark crosswalls, but crosswalls (of any color) are very difficult to see in the field, even with a 10x hand lens, and seeing dark crosswalls on dark hairs is even more difficult. 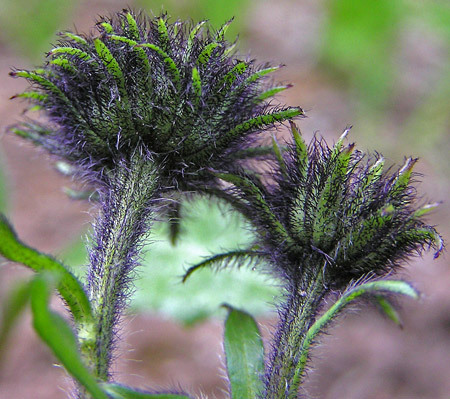 But it is very easy to see the distinguishing characteristic of a multitude of black hairs on the underside of the flower head. Varying stages in the opening of the flower heads can be seen here. At the top, the flower head is fully open and at the very bottom the bud has just opened enough to show the ray flowers, which now appear yellow but which will soon turn white.